I love the Honest Company Dish Soap we use at home but it’s still a luxury. It’s concentrated and little goes a long way, but I like the squeaky clean finish so much that I end up using more liquid soap than I really should. This results in an empty bottle every week or so, which is way too much, especially at about $6 for 16 fl. oz. I didn’t want to walk away from my Dish Soap – I love it way too much – so I needed to come up with a creative way to stretch the cost. I tried diluting the liquid soap by adding water but I ended up using double the amount. I thought about alternating it with a less expensive kind but I don’t like the heavy artificial scent and the filmy residue that many supermarket brands leave behind. I never entertained the idea of making homemade kitchen soaps but after doing some research online, I found that it’s a pretty common thing. I found lots of great ideas for which oils to use, particularly from this cute Japanese soap-making blog. Necessity is the mother of all invention, that’s for sure! 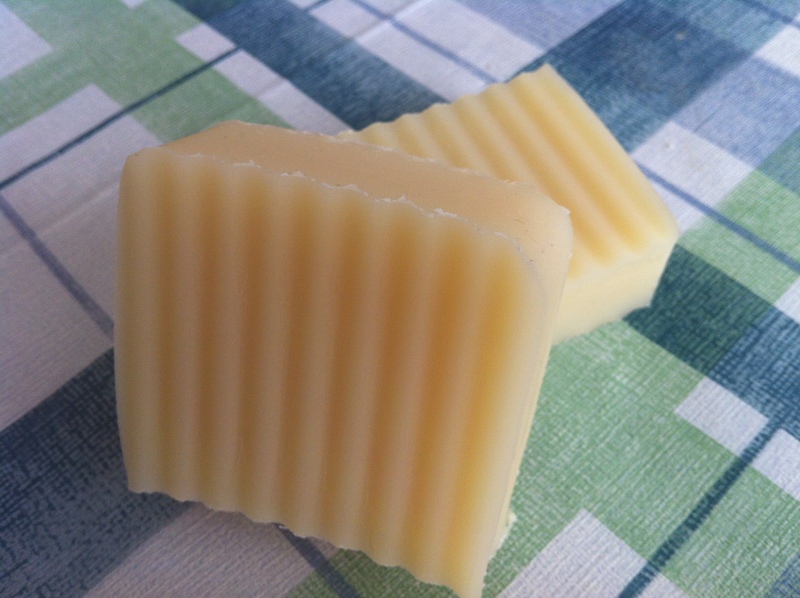 I created a recipe that used mostly Palm Oil (to create firm bars) and Coconut Oil (to provide a nice lather), and threw in some Olive and Castor Oils as a good measure, to provide a little bit of moisture for the hands. 1200 gram batch — makes about 14 bars, at 4 oz each. I’m only sharing the recipe / ingredients and not the instruction. 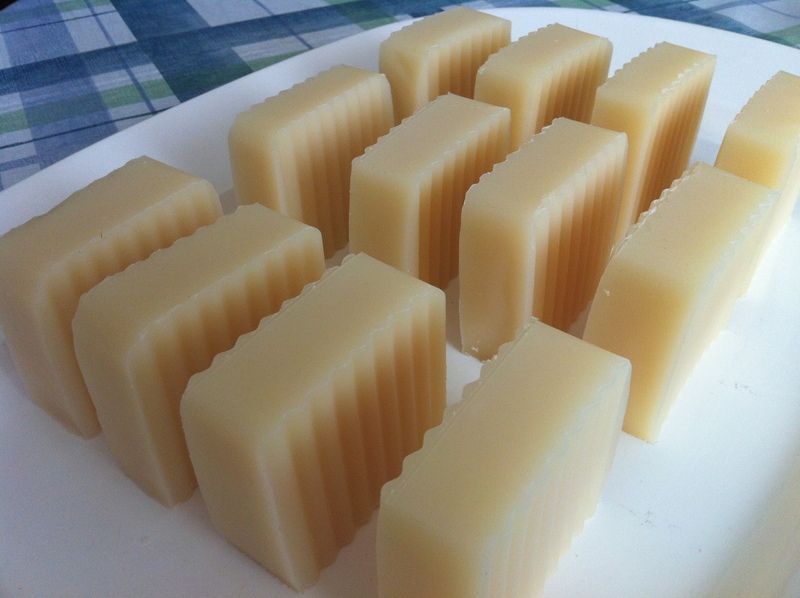 Please refer to soap making books or online resources for a proper and safe soap-making process. The bar holds its shape well, thanks to Palm Oil. I put the soap in a little bowl and the water doesn’t drain completely after each use but it’s still nice and firm. The lather is perfect! I’m not into big bubbles so the finer suds this soap produce are just right. The scent is refreshing without being too artificial. I’m happy with the Cucumber Melon Fragrance Oil from Bramble Berry, especially because I got it as a free sample! I feel like the dishes don’t get as squeaky as Honest Company’s, but you still get the nice clean feel. You can definitely hear the squeak when you rub the dish after a nice wash. The suds wash off the sponge faster than the liquid kind so you might need to reapply more frequently. I was pleasantly surprised to see that the soap doesn’t leave a streak on glass and stainless steel pots! I’m so satisfied with the homemade version, I may not need to go back to the Dish Soap for a while!